OMG Posters! » Archive "Orange Crate Kid" Art Print by Rob Schwager (Onsale Info) - OMG Posters! Rob Schwager just may be producing the most underrated, affordable art prints covered on this site. 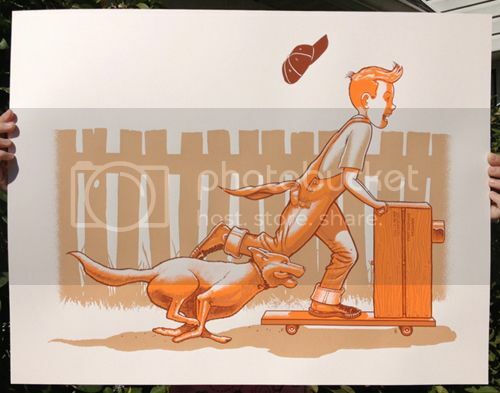 “Orange Crate Kid” is an 18″ x 24″ screenprint, has an edition of 100, and will cost $25. There will also be a wood version with an edition of 5 for $65. Everything goes up tomorrow (Tuesday, January 29th) at 7pm Eastern Time. Visit his shop. Rob’s prints are just wonderful in person. I’m a sucker for the nostalgia he always portrays. This looks great. Always dig Rob’s stuff.